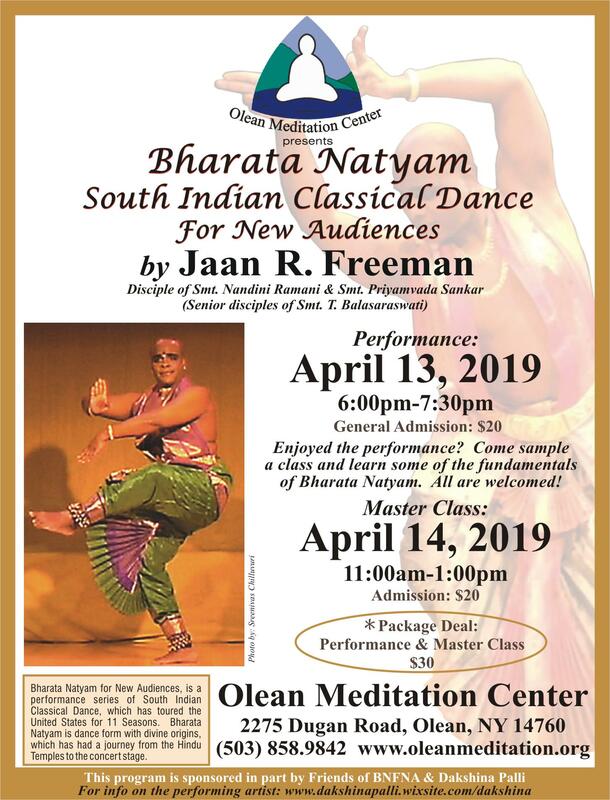 The Olean Meditation Center will offer a rare performance of the Bharata Natyam, a classical Hindu dance of South India, from 6 – 7:30 p.m. Saturday, April 13 at the Olean Meditation Center, 2275 Dugan Rd., Olean, NY 14760. Jaan Freeman, founding director of Dakshina Palli Dance School of New York City, will bring to life the beauty, artistry, and spirituality of Bharata Natyam. A Master Class will be offered for those interested in learning the unique techniques of the ancient dance, from 11 a.m. – 1 p.m. Sunday, April 14. The cost for each is $20. The cost for both the performance and the master class is $30. Bharata Natyam, which means “Bharata’s dancing” in Sanskrit, is a classical Hindu dance of India. It stems from the Tamil Nadu region and yet is prevalent in southern India. Bharata Natyam expresses Hindu spiritual ideas, virtues and the essence of scriptures featuring religious themes and devotions. It is dated to between 200 BC and 200 AD, but estimates vary between 500 BC and 500 AD. It is found in the Natya Shastra, the ancient Hindu text of performance arts attributed to the ancient scholar Bharata Muni. The Natya Shastra text consists of about 6000 verses structured into 36 chapters. The text details the expression, gestures, acting techniques, basic steps, standing postures—all of which are part of Indian classical dances. The ancient text of Natya Shastra was composed by the Brahman sage and priest Bharata. A program of Bharata Natyam includes a specific list of procedures, all performed by one dancer, who does not leave the stage or change costume.